We’re excited to announce our first “printed” coloring books! Almost every week, readers have been asking me how they can buy printed versions of our wildly popular Bible coloring pages. Our first priority is giving away free materials, so that project has been on hold for many years. Today, we are releasing our first “printed” editions. These are the same great coloring sheets we give away on our website, but many readers wanted a hassle free way to get them in a book format. We are selling them “at cost” on Amazon so we’re not making profit – it’s just a way to serve our amazing readers! I would love to have these added to our Awana Store! Kids earn bucks for verse memorization and other things, then each quarter, they go to the “awana store” to buy special items with those bucks. I know that they would love to have this as a purchase option. How wonderful!!! I would share the 10 copies among the children in my ministry. May even use them as prizes for verse memorization. I would give my books to my class for a ministry I teach at called The Gate. It is a Thursday evening program that feeds the children a meal, provides them a back pack of food to take home, sing songs or learn the bells and hear a lesson about the Lord. They looove to color and I would love to give them each a book to keep — I typically have pr K/K and have between 12 and 18 children –( the program itself has grades pre k- 12th grade — approximately 60- 80 children in total )–so I may have to use the books as a prize rather than a gift, but it would be great!! While I am leaving comments — I would looove to have the prayer emoticons in black in white, I don’t have a color printer and I would like to use it for prayer time for my Gate children. We have an after school “Good News Club” for the kids every Monday. The kids always get so much excitement over coloring & activity books. Then the great part of it is that when they take them home the “Good News of Jesus is spread into their homes with family! I would use these coloring books to grow my childrens ministry. I want the kids to learn the books of the bible. We just finished the 12 week Books of the Bible series for this summer so I would give them to kids if they can recite all 66 books of the bible for me as a reinforcement of what we learned this summer. I would use the comic book pages as a way to share with my unchurched neighborhood children as well as the children that are in my church. Both groups need to see and hear the gospel! My kids would love these for our bible class and to keep in the car for activities while on trips! We would also share with our friends with kids in our co-op! WOW! I’m a Children’s Ministry Director in a very poor downtown area and this resource would be an excellent gift for our neighborhood kids at Christmas! Those that don’t know how to navigate their way through the Bible, but want to learn simple truths about Jesus. Just having this resource available to Children’s Ministry Teachers as well to use as supplements in their lessons also! Love that Ministry to Children started working on these projects…completed them well and is now making their work more accessible in book form! Awesome job! Excited to see what’s next!! I would love these as a printed book! My younger youth kids would love them! I love these books! They would be perfect for the children at my church. I serve in the Children’s Ministry at an inner city church in Memphis. These kids love and cherish anything- no matter how small. They would love these! Watched the video and wrote a review at Amazon.com for both books. Thank you for all you do to help church teachers and leaders impact children. I teach 4 & 5 year old Sunday School at my church. These books would be great for an early arrival activity. The alphabet one would be especially great for “my” kids, because many of them aren’t really reading yet, but they do know their letters. Such beautiful books! I would love to use these books for our homeschool group! Thank you for the giveaway! I would love to use these books in our Children’s Church. We have a small congregation and 10 would be enough for our kids. Love your curriculum. What beautiful looking books! I think they could be a great asset to my church, and I can think of several ways we could use them. We often have activities available for our weekly Coffee Hour, and I think the kids would love to color these! They might also be a great way to keep kids entertained during various adult ministry meetings. Perhaps we could make up a couple of ‘entertainment boxes” for when parents bring their children along with them? The alphabet books might be great in the pews with younger, restless parishioners; while the story books might do better when done with an adult to talk with. Beautiful books! Well done! 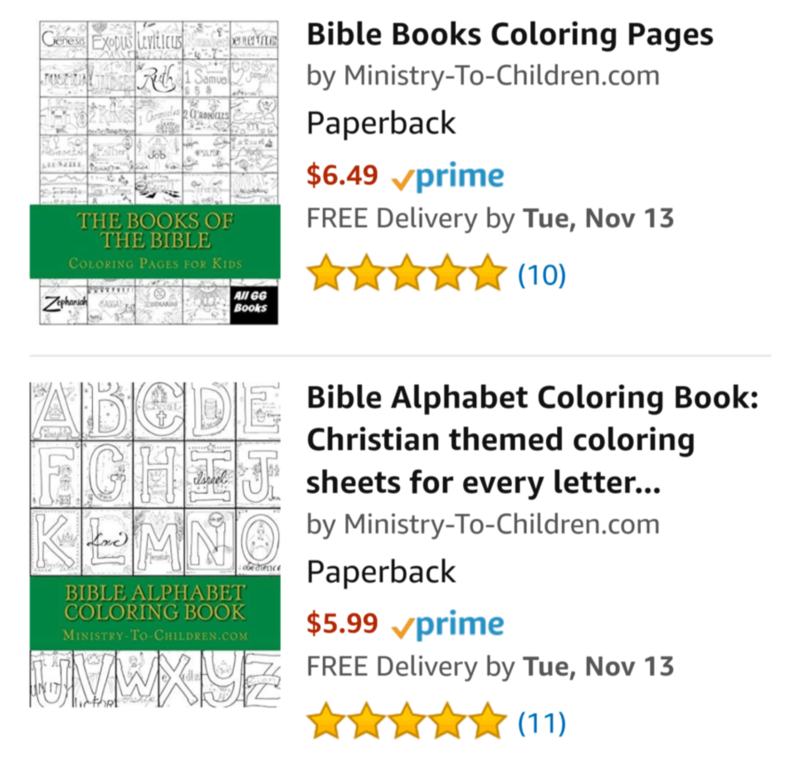 I would love to use these coloring books both in Sunday school classes to teach kids books of the Bible, but also the letters in Children’s church as we has lessons and the kids learn their letters and Bible characters. This is so awesome. I would definitely use the Books of the Bible coloring pages as an aid and activity for the Books of the Bible memorization. The other coloring book would be an activity linked to the Bible lessons being taught. We have some of the poorest children coming to Children’s Church. They love to color and they love learning about Jesus. Thank you for the opportunity to win these precious creative visual tools for children. I have 10 students in my class of First Graders. What a great thing to have! And thanks for the video and all of the items available through your ministry. We are blessed! The Alphabet Book would be a great addition to my curriculum. I do crafts for 2 church campuses and pay for it out of my pocket so this book would be a blessing as I could use it as a biweekly craft. My Sunday School class, loves to color, the books of the Bible would be a perfect tool to help them learn, and have some fun too. 10 is a perfect number of books because that is about how many we have. I would use them for the children’s ministry. I would give the books to our small rural church of 50-60 people – they would love to give these books to the children’s church program. With 10 books – each child could take one home and share with their families. thank you for this opportunity. The books look great and thank you for taking the time to bind them. We, also, have a small church. We have Children’s Church, Sunday School, Awana and host the CEF Club at our Baptist Church every Friday. The books would be great to have as additional resource for our Children’s Ministry. Searching the internet for additional material, works to supplement our curriculum but it is time intensive. Having these books to try out, would be wonderful. Thank you for the opportunity to receive them. I love your website! Thank you for making it available for free. We are a small church with limited resources and you have blessed our children’s church and Sunday school so much! The coloring books would be a great blessing for us as well! Thank you for all you do for the Lord. You will be amazed when you see your eternal fruit in heaven! What a wonderful idea! I would use these coloring books in our “Kids Connection” (Sunday School) at our church, Hope Community. They would also make wonderful Christmas gifts for my students. I would use the coloring books for Sunday school and at home with the grandkids. 95% of the Ministry-to-Children website has been used for Sunday school. I love this website. I teach Wednesday Kids Club and we are currently working our way through the Bible. We learn about one book of the Bible each week. Will be learning about Proverbs this week. So if I had 10 copies of these coloring books I would use them in my Wed night kids club as part of reviewing the books of the Bible and their key importance. This is.a.great outreach ministry through kids church and through our church Kindergarten. I love these coloring sheets. I have used them numerous times for children at church. I would love to have these for my preschool department because doing something “hands on”, especially the book of the Bible sheet just help reinforce the books they are learning and they are fun. I love the alphabet ones also because in preschool they are learning the alphabet and starting to put these letters together to read. This would be a nice gifts for Birthdays, special class room promotion or a gift for learning some memory verses that your class has been working on. Our small church has started children’s church during worship. These books would be great to supplement our lessons. This is so exciting! We are going to begin a study on the books of the Bible in January, and these would be perfect. I love the idea of the kids being able to take the coloring books home– perfect for a church to home connection. I would love to have these available for my foster children that I care for full time. They usually come to me with nothing and I would welcome these to give to them!!! I would use them in our small children’s church ministry. I use ideas from your web page all the time. I would use these book to help teach my nephews and nieces about the bible and alphabet. Also, I would donate them to the Sunday school ministry. I would love to be able to share these books with my students and the staff at my school Carden Christian Academy. We study one bible story and learn a new bible verse every week. These books would be a valuable asset to any classroom especially ours. Just started teaching again. These would be great for the class. These would be perfect for my children and Bible class. Love the concept of coloring sheets depicting the Books of The Bible. The materials seem so kid friendly. Because we work with a limited budget, I would be delighted to share these books with the children , not only my class but with other teachers as well. Trying to find the perfect color sheets to go with a corresponding lesson can be a daunting task. I am so sure our children will be as excited as we, the teachers are. I’m always trying to find coloring pages to include in my work package for Sunday school. These books would be awesome. I would also use them as prizes and or gifts for my Sunday school class. Besides Sunday school class I could share the books with the friendships groups so they can also have something for the visitors children. I have a small group of young people on Wednesday night and I would love to share the gospel in these coloring pages. I tutored children who are struggling st school and cannot afford to pay for high costs tutoring rates. They come to my house four times a week. I feed them and then work together the school assignments. I have been doing this for over 30 years. These books will greatly help to offer them a small reward every time they increase their school grades usually I get small items for this purpose and with your coloring books it will make it easier for me since I live on a tight budget. I would use my copies to bless our children in the church I attend. Thank you for this opportunity in sharing the word with our young ones. I alternate in using the powerpoint and teaching the bible from a hardback cover bible. God bless! I would love these; probably share these with other Children leaders across Colorado. Love the color pages to give to children as I tell stories to the Children in my Church story telling. I would share these with my very small Junior Church kids. they love to color and we are so small this would be a delightful treat for them. We would use these in kids church. God has recently, led us to a new church that has been struggling. What a blessing this would be! Our Sunday School at church is growing. As our younger children get older they love to color while waiting for class to start. It just so happens we have 8 students in our younger SS group so there would be enough books for all of them. Love the coloring book! I’m a kids worship leader at or local church & i would use these either during class as rewards to answering questions or during worship practice with the kids for good behavior. Good bless y’all! I would share them amongst my other teachers to use or prizes for doing something special. I want them to know what they are getting is very important and special. I love using Ministry to children to teach my preschoolers about the Bible. I would continue to use these coloring books to teach my class. I would use the coloring books as prizes in our fall festival. The kids would absolutely love them and I know they’d get gone real quick. I would use them in childrens chruch. We are learning the books of of the bible and this would really help me. The books of the Bible are great. Having the pages bound together shows the flow as we study the books. Instead of individual pages, the children will be able to review the pages they completed as they color a new page. Thank you. I would place them in our Sunday School resource library at church and also use them as a supplement for children’s church activities! Question – do any of the pages have Scripture on them? If so, which version of the Bible was used? I used your Armor of God study in our homeschool last school year and came back looking for more! I would love to win the copies of your new printed coloring books to take to our homeschool group annual kick off party in September! I would love to share these at our homeschool group’s Fall Kick Off Party and tell them how I used your Armour of God study last year! Your materials are perfect for our homeschool! These books would of course be a great teacher resource for lessons, but would be great for prizes given for memorization of scripture, perfect attendance, birthdays. Our program has a Bible Memory Book that focuses on scripture, the days of creation, the 10 plagues, the names of the apostles, bible passages….. Each time a child completes a part of any level of the book, they are given a prize from the teacher. These would be a great prize for those who love to color. I have enjoyed the coloring pages as you have shared them. Wishing I had found this website and your coloring book Bible two weeks ago! I’ve already purchased Bibles for most of the kids in the Sunday School class that I’ve been blessed with the opportunity to have the past few months …. CONTINUOUSLY! It’s awesome knowing that I get to see their faces each week; that they are doing their Good Deeds; that we get to explore God’s Word from the beginning! And, every time we study a new verse or recite a story, either I or a child learn something knew about Jesus — I’m 50 years old! It’s exhilerating learning something knew about something I thought I knew! Just like today — I was raised to NOT color in our Bible. Now, you are giving us the titilating opportunity to win Bibles in which we are SUPPOSE TO COLOR WITHIN! The dearies in my class would be sooooo excited to receive one of your “printed” Coloring Bibles — just as I would! So, I’d appreciate you considering my Sunday School class as one of the many from whom you will chose to receive the freebies. Thank you in advance for your consideration and for even thinking of us. I love the coloring books. I have been trying to come up with suggestions to encourage my students to get more involved in Sunday School consistently. They have a tendency to come once or twice a month. I want to make the lessons interesting that more engaging for them and practical. I teach Junior and seniors girls and I know that girls love to color regardless of their age. So, I would use these coloring books as an incentive for coming to Sunday School on a regular basis, for class participation, for early arrivals as well. Thanks for this opportunity to participate. Hey! I do Children’s Church on Sunday mornings with 4-12 Year olds… these would be perfect to use with that since I already use quite a bit of your lessons already (and love them BTW)… also, I teach K-2nd grades on Wednesday night’s and these would be great to reinforce the lesson I have taught that night. They are fun and the kids love things like that! I would use the coloring books to make copies for our devotions after school. We have 14 schools that we work with in the community and are always looking for more resources to implement our Christian character development sessions! To be honest we have a very small country church and only one main teacher for the children of all ages. If we had one or two of these coloring books it would be so helpful for that class that sometimes has 4 year old’s to 17 year old’s. A challenge indeed to keep the attention of 4-12 students of different ages. I see this could be helpful to the teacher and students. Thank you for all you do to help children learn more of the precious word of GOD. I am so grateful that you added me back I am in Nigeria,I want to know how this materials can get to me fast,I also need a lot of mentorship ,please I would not mind if you can help,I will be happy to hear from you soon God bless you for all the wonderful work you are doing. Tony Kummer (Editor) reviewed & updated this page on : February 18, 2019 at 7:53 pm. All our content is peer reviewed by our readers, simply leave a comment on any post suggest an update.